We've given the classic pairing of peanut butter and jam a bit of a twist. 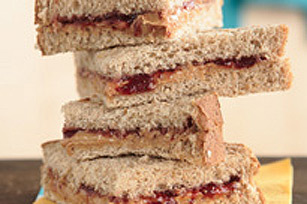 Quartered and stacked, this peanut butter and jam sandwich becomes a PBJ Tower! Spread 1 of the bread slices with peanut butter; spread remaining bread slice with jam. Place bread slices together; cut sandwich diagonally into 4 triangles. Stack triangles and secure centre of stack with wooden popsicle stick. Wrap stack in plastic wrap to pack. Substitute Philadelphia Cream Cheese Product for the peanut butter.